How to use Google Plus for marketing your business was one of the topics we covered at this months free Social Media Roundtable at the Shah Center in McHenry. Few of the attendees were aware of Google Plus and how to use it as a marketing tool. Visit our CyberLife Tutors calendar to learn more about our upcoming Social Media Roundtables and another events. Google indexes updates and photos shared on your Google Plus business page for Google search. When someone does a Google search for the words included in these posts, they may see your Google Plus comments in their search results. Free search engine optimization (SEO) for your company! Customers often tell me they do not know what to say on social media sites. It is exhausting to creating new content for your social media sites. Instead, post links to interesting articles you read and add your own two cents. That is what I did with the infographic below. Start with an idea then package it with your own learnings and knowledge. The best time of day to post is not the same for all businesses. As dallas seo expert advises us, “Consider your audience and when they log in. During the class, attendees said they check social media sites before work (7AM), at lunch (noon), about dinner time (5PM) and before bed (10PM).” If your audience crosses time zones, adjust your post times to match so your content is more likely read. Google Business Pages consolidates content from former Google Local pages including photos, hours, maps and reviews. Connect with customers and prospects to build relationships. Build a customer service hub. Create a public forum for others to gather, share and learn. The infographic below suggests we spend an hour on Google Plus each day. For most business people, I find that amount of time excessive considering they are also using other social media sites and have a job to do. Certainly, devoting 15 minutes a day to your Google Plus account would be a great start. Google is beginning to roll out vanity URLs for Google Plus to a small number of members. You can get a gplus.to Google Plus vanity URL today. Connect with CyberLife Tutors and April M. Williams on Google Plus. Click on Comments and tell us about how you use Google Plus in your business. Pinterest is a content sharing service where members “pin” images, videos and other objects to their pinboards. Pinterest also has standard social networking features so you can share with your friends. This weekend I will be demonstrating the features of Pinterest at the Algonquin Library. For more information on this session, visit our events calendar. Pinterest members create virtual boards for different topics. Create a board for your hobbies, favorite restaurants, post your resume or to show off your professional portfolio. 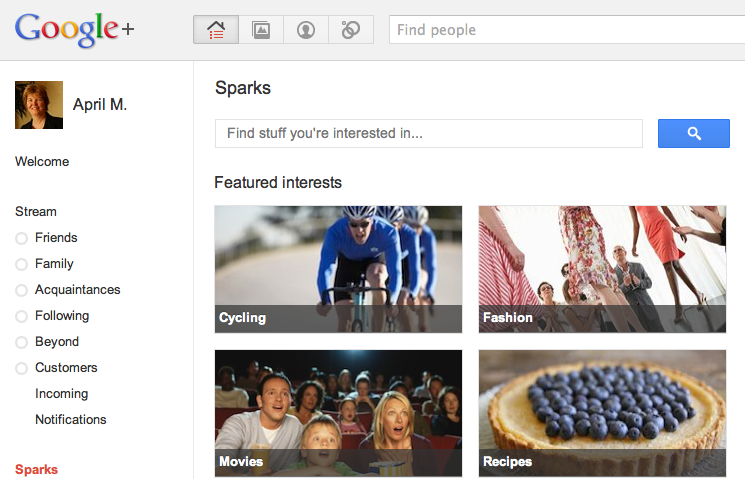 Search Pinterest for topics of interest. When you find an image or video you like, you can repin the object to one of your boards. My Pinterest boards include food, travel and McHenry County happenings. Here is how you can get started with Pinterest. Create your Pinterest account by connecting with Facebook, Twitter or using an email address. Have fun with your new Pinterest boards and pin what is interesting to you. Share your pins with your friends on Facebook and Twitter for greater visibility. We are always interested in hearing your ideas for using Pinterest. Click on COMMENTS and tell us how you are using Pinerest for yourself or your business. Enter your email in the box on the right and click subscribe for more tips on Pinterest and other social media tools. Facebook Profile Settings can be adjusted to restrict the amount of information you share with others. Some people are comfortable keeping a tight rein on their settings while others are less adverse to sharing. You can update your settings whichever way you choose. To view or change your Facebook Profile Settings, start at your profile page. Click on Edit to Restrict personal information in each “About You” section. I recommend you do not show your year of birth. This information can be used in identity thefts. Update “Contact info” to show only that information that you are comfortable displaying. Facebook Likes appear when Facebook automatically connects you with Community or Business Pages based on the music, books and movie you enter on your profile. To remove these references, visit the page and click “unlike”. When these settings are adjusted to your satisfaction, be sure to click on “save”. Facebook with over 8,ooo,oooo users is a place to connect with friends. Facebook privacy setting can be confusing. If you do use Facebook, here are ways you can utilize Facebook privacy settings to restrict who sees the comments, pictures and videos you post. On the upper right corner of Facebook, select “Privacy Settings” using the drop down arrow next to “Home.” One this page, you can set your Privacy Seeings to your comfort level. To strictly resist your content, choose “Friends” for most of these settings. Adjust “How You Connect” to control how you connect with people you know. *** When disabled, people can tag you in photos or status updates, and those items will automatically go to your Timeline. *** When enabled, you will be allowed to review it first. These posts will still exist in the timeline of the friend who created the content just not your Timeline until you approve it. Adjust Apps and Websites to control what gets shared with apps, games and websites. Adjust “Limit the Audience for Past Posts” to limit the audience for posts you shared with friends of friends or Public. Adjust “Blocked People and Apps” to manage the people and apps you’ve blocked. After adjusting each of these settings, click on “Done” to save your choices. By customizing your Facebook privacy settings, you control access to who sees the content you choose to share with others. Fear of losing privacy on Facebook is one of the most common social networking fears I hear. People are concerned their personal information will become private, that everyone will know what they are doing or their financial data will be at risk. While internet hacking does occur, your best defense begins with use of good general internet best practices. This is the best protection for your internet privacy. Never share personal information or anything you are uncomfortable with others seeing. Even with privacy settings, things can get out and become public on any site.This goes for for comments, pictures, video or any other medium. My benchmark is this: Would I feel comfortable with my Mom or Grandmother seeing this remark or picture I posted? If the answer is “no”, I know it is a comment which should not be made public. Use strong passwords and change them often. Create mnemonics to help remember your passwords. For example: “every good boy deserves fudge” -> egbdf. Use a different passwords for each site so if someone gets access, they cannot get into all of your accounts. This is some risk with any internet site. By using internet best practices, you are more likely to retain your privacy and keep your data secure. Google Plus Business or Personal pages are now available to all. I created pages for myself and two businesses then noticed the page URLs are lengthy. A long URL is hard to remember and accurately type into a computer. I used a neat tool to shorten the URL to a memorable set of characters. Here are examples of how the original Google Plus URLs look compared to the shorter versions of the URL. You can create your own vanity URLs at http://gplus.to. Just enter the original Google Plus page URL and the desired new URL. Your will then have a Google Plus page URL http://gplus/username. Need assistance getting your Google Plus page set up? Call us at 414.604.6645 to do it for you. Businesses and organizations can now create a Google Plus pages to market themselves joining millions of individuals. You can set up your Google Plus page following these steps. Google Plus Pages for business and organizations will bring changes to the way search results are displayed. Visit our CyberLife Tutors Google Plus page and add us to your circles. If you have any questions or would like me to set up your Google Plus page, just give me a call. When Google’s new social networking site Google+ launched several months ago, it was invitation only. To create an profile, someone had to send you an email with an invitation. As of this week, Google+ is available to everyone. Like Facebook, Google+ is changing and evolving rapidly. There is even a Google+ app for your Android or IPhone. Google+ is a new social networking site from Google. Launched in beta mode in July 2011, the site had 10 million users within two weeks. This figure is more amazing because during the pilot, an invitation was required to join. Here are how to resources so you can get started with Google+ quickly. An email address is required to sign up for Google+. If you ask for an invitation, be sure to include your preferred email address with your request. Create your profile. Include your work experience, hobbies and any other information which is relevant to your background. Include keywords in your descriptions. Find connects using the search box. When you add contacts, you will see there updates in your stream. Organize your contacts into groups or circles as Google+ calls them. Cluster people by how you know them, relationship to you or any other way that works for you. Google notifies them they were added to a circle but does not state the name of the circle. For more information read more tips for Google+ Newbies. If you would like an invite to join Google+ enter a comment below including your preferred email address. Following Twitter etiquette and showing good social networking manners is not hard to do. Here are six steps to stay on the good side of other social networking and not become an online clod. 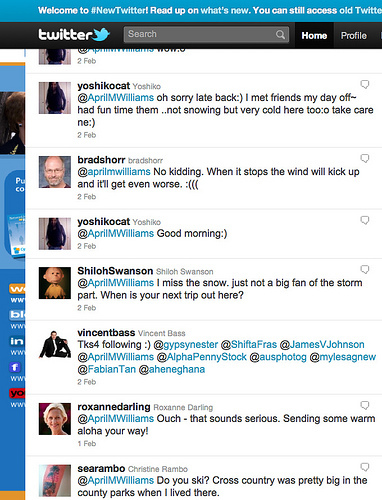 Use @ replies: When mentioning another Twitter account, use the @username to let them know you made a comment. Without the “@”, the account you are mentioning will not likely see your tweet. Retweeting: Share others messages by retweeting or rebroadcasting tweets to your followers. If a message exceeds the 140 character restriction, it is OK to trim or modify the message to fit. Be sure to keep the original message intent. Be interesting: Include a variety of content in your Twitter tweets. A stream of pure sales messages will likely turn off followers. Post pictures of interesting sites, links to industry news articles or just plain old fun comments. Be personable. Follow back: With Twitter, it is a good practice to follow those who follow you. Twitter restricts the number of accounts you can follow based on the number of Twitter accounts following you. Once you follow 2,000 accounts, Twitter will not allow you to add new accounts to your following until you either unfollow some or others begin following you. If you do not follow back, you will find many accounts will unfollow you. Stop the auto messages: Don’t set up messages to automatically send a response when an new Twitter account follows you. I recently received a direct message from someone I followed saying. “Thanks for following me. I look forward to reading your tweets.” This was a meaningless message to be because this account did not follow me back. They never did see any of my tweets. The message was meaningless and cluttered up my messages pages. By following these six social networking tips you can navigate Twitter and use tweets for business while using social networking with etiquette and good manners.